Day 1 of the WSOP Casino Employee Event is in the books. A field of 731 entries came to try their hand at winning the first WSOP gold bracelet of 2016. Only 23 players remain, and Spencer Bennett holds the chip lead with 627,000. Bennett snuck into the lead over Matthew Tyler after Tyler spent most of the day knocking players out left and right. At one point in the tournament, Tyler had five times the average chip stack and seemed to be cruising to the lead. However, he kept getting hands and attempting to bust players with much less success than before. With 25 left, Eric Stack (178,000) earned a double off Tyler when Tyler opened the button to 22,000 and Stack shoved 100,000 more. Stack had against the of Tyler. Stack spiked a king on the river to double and leave Tyler with only 11 big blinds. He ended the day with 91,000. 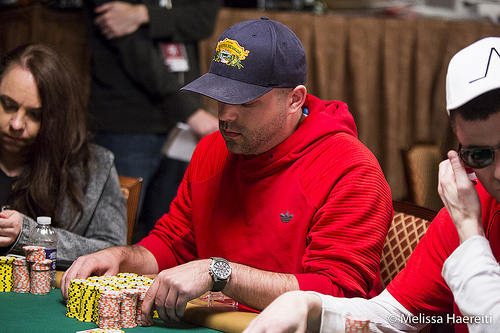 Kerry Craigie finished the day in second place and will be rocking a stack of 323,000 entering Day 2. Nicholas Swilinski (310,000), Tanja Vujanic (195,000), Amanda Wheeler (182,000) round out the top five. With Allison Arvey sitting on 164,00, that puts the four remaining female players in the top third of the field. Some players who made the money but failed to survive to the day. Notables among the 110 players who cashed in this event include WSOP staffer Simone Ricci (106th), Jason Stern (60th), former WSOP Dealer of the Year Shaun Harris (56th), last year's Casino Employee Champ Brandon Barnette (55th), and 2007 Casino Employee Champ Eric Narciso (36th). A complete list of results so far can be found under the Results Tab. The seat draw for Day 2 can be found in the Reports Tab. The remaining players will return tomorrow at noon and will play down to a winner. Stay tuned to WSOP.com for updates throughout the day as the players compete for the first WSOP gold bracelet of the summer. Play has concluded, and the players are bagging and tagging their chips. A full recap will be posted shortly. Henry Thiel open-shoves all in from the button for 107,000. Nick Sliwinski calls from the big blind. Thiel shows . Sliwinski shows and utters a loud sigh of dismay. The flop comes and Sliwinski lets out a loud "Oh!" as he outflops the bigger pair with a full boat. The turn is the and the river is the , leaving Thiel's jacks cracked. Randall Bostick opens the action with a 72,000 shove from the cutoff. Chris Jones calls from the big blind. Bostick has against the of Jones. The board comes out and Jones wins the hand with a full house, sevens full of kings. Raynard Luna raises in early position to 28,000. Amanda Wheeler shoves for 95,000 and Raynard calls. Raynard shows against Wheeler's . The flop favors Wheeler with , and a turned leaves Raynard drawing to only four outs -- two nines and two tens. The river, though. is the , and Wheeler wins a big stack of chips from Raynard. Matthew Tyler opens from the button to 22,000 and Eric Stack shoves from the big blind for 100,000 total. Tyler calls and shows and is ahead of the of Stack. However, the board comes , giving Stack the pot and the double and leaving Tyler with just over 100,000. Earlier, Matthew Tyler was the far-and-away chipleader, but the last few levels haven't been very friendly. After basically winning every all-in, he's now doubled a few players up as the field narrows toward two tables. Stephen Conyers is eliminated in 28th place and Gorge Hays is eliminated in 27th place, and they're now redrawing for new seating assignments. Action has been paused while the field recombines around the final three tables left in play. The draw and counts will be posted here shortly. After an improbable triple-up just before the break, Michael Hewett is once again in jeopardy after paying the blinds. When Tanja Vujanic raises to 16,000 from Hewett's right, he goes all in for 8,000. The big blind calls the 16,000. The flop is and Vujanic bets another 16,000. The big blind folds. Vujanic exposes her hand: . Hewett shows , saying "I'm dead." Two inconsequential cards hit the turn and river, and Hewett stands up to collect his payout card. On consecutive hands, Matthew Tyler eliminated Zackary Moore and doubled up Raymond Luna. On the first hand, Tyler made it 24,000 and Moore shoved for around 100,000. Tyler called. Tyler had and hit a king on the flop. His hand held and Moore was eliminated. On the next hand, Tyler was in the big blind. Luna shoved all in under the gun and Tyler called from the big blind. Luna had against the of Tyler. The board came , giving Luna the win and the double-up. Players are on a 20-minute break. Action will resume shortly. Amanda Wheeler shoves all in for 48,500 with and Matthew Tyler calls with . Wheeler is at risk and up against the chip leader in Tyler, who has been winning most of his all-ins during the day whether behind or ahead. This time it is Wheeler's turn as the board runs out , and she doubles up. Ronaldo Rodriguez shoves all in from late position for about 40,000, Tiankang Xing calls from the button, and the blinds fold. The board runs out , and Rodriguez is out. In middle position, Eric Narciso, the 2007 winner in this same event, shoves all in. Tanja Vujanic then shover over the top from the button with her larger stack. The cards go on their backs and Narciso has to Vujanic's . The flop is , with a turn and river to follow. Both players miss the board and Vujanic wins with the ace. The action folds to the Sarah Lee on the button, who moves all in for about 38,000. The small blind folds and the big blind, Spencer Bennett, quickly calls. The board doesn't help Lee, who is eliminated. Kerryjane Craigie raises to 12,000 in late position. She faces a smallish 36,000 all-in from the big blind, and she calls. She reveals . Her opponent, the all-in player, holds . The flop comes . Kerryjane's expression is gleeful, no poker face here. The turn is the . The river is the . Kerryjane Craigie has crested the 100,000-chip mark.